Our partner Lloydz is at it again, this time he’s crafted his version of the legendary group base design, another quality RUST Base Design! The first thing to note about this base is the size, it’s quite intimidating for a group base. The very appearance of the base design is enough to keep many small potato raiders away. With a single, but focused entry point this base has your standard airlock system. Deeper into the base you’ll find garage doors have been replaced with reinforced glass windows. Table tops are used as a convenience to move through the interlocked pathways. In the core of the base, you’ll find a few techniques being used such as bunker floors and unlootable loot rooms. On the second floor, you’ll find a rather large series of furnace and storage rooms. Above that, is the open floor window rooms for visibility and base defense. This floor also allows for quick-exit points to get out of the base. Lastly, you’ll find roof access for a full 360 degree view of the surrounding area. Be sure to browse Lloydz’s past RUST videos and don’t forget to subscribe to his channel for alerts on his latest work! 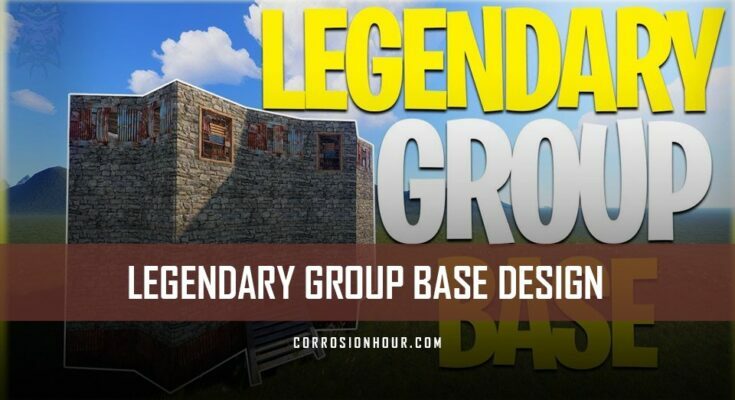 Hello everyone, welcome back to another video, in today’s video I’m going to be showing you how to build, the legendary group base design. This design features a bunker base so I really do hope you enjoy, anyway let’s get right into the tour. Jumping straight into the base we have normal 2 door airlock, however here we’re using garage doors. I’ve not placed them as it would be me opening doors the whole video. Jumping up as you can see its not your normal base, we’re using windows instead of doors, these are two C4 to break through which are the same as armored doors. Coming past lots of windows we have our un-lootable loot room featuring four large boxes and here we drop down into the bunker. The way these bunker works is placing a half wall here has enough support for a floor. Remove the twig when you want to go up and of course, place a ladder to jump up. Anyway, down here we have loads of boxes a tier 3 workbench and the tool cupboard. Coming back up through the windows, we go up the ladder hatch, this floor is completely up to you, I’d recommend placing some beds, more storage and some furnaces. Coming up another ladder hatch here is your very simple window floor. I’ve kept this very simple as you can make it however you like, I’ve added some lookdown points in the base by using doors and that’s pretty much it. I’ve done the build in stages as it is quite long, if you haven’t already, like the video and subscribe for more bases like this, thanks for watching and I’ll see you in the next one!